The Central System (Sistema Central) is a mountain range that lies in the centre of the Iberian Peninsula and which has a length of about 600 kilometres. It runs from the centre of Portugal in the west, where the mountains are known under the name Serra de Estrella, towards the east and a few hundred kilometres further towards the northeast, where it borders with the Iberian System (Sistema Ibérico). It constitutes the natural frontier between in the north Castile and León and in the south Castilla-La Mancha, Extremadura and Madrid and also divides the Inner Plateau (Meseta Central) in two parts. The name Sistema Central is not very frequently used but instead the mountains are known under the individual mountain ranges of this area, among others the following mountains where hikingiberia.com offers various hikes. The Sierra de Gredos is the highest and most rugged part of the Central System and lies in the provinces of Ávila, Cáceres, Madrid and Toledo. The highest point is located in the province Ávila, at the Almanzor at 2,592 metres, which is also the highest point of the entire Central System. The Sierra de Gredos is characterized by its large masses of granite, and from the south face the mountains give a relatively steep climb. 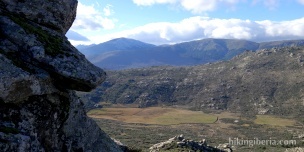 At the heart of the north face of the Sierra de Gredos lies the Circo de Gredos, a cirque created by a glacier. It is the main cirque of the Central System and measures approximately 33 acres. In this cirque you find the popular Laguna Grande, Almanzor and the refuge Elola, used by many climbers and hikers to go to the Almanzor. The bare, rocky high mountain landscape of this cirque is spectacular and one of the absolute highlights of the Sistema Central. To the east, towards Madrid, the Sierra de Gredos changes into the Sierra Oeste de Madrid, the most western part of the Sierra de Madrid - collective name for the various mountain ranges in the province of Madrid - and is adjacent to the Sierra de Guadarrama, which is also part of the Sierra de Madrid. The Sierra Oeste de Madrid is the least known part of the Sierra de Madrid, except for the reservoir of San Juan which, because of the fact that it is the only reservoir in the province of Madrid in which swimming is allowed, can be overcrowded with visitors from the capital. Because in this part of the Sierra de Madrid the mountains are considerably lower than in the Sierra de Guadarrama and the Sierra Norte de Madrid, the hikes are much more accessible for a big audience and can they also be perfectly done in winter. The Sierra de Guadarrama is the most central part of the Sierra de Madrid. It lies primarily in the province of Madrid and partially in the province of Segovia. Its highest point is the Peñalara with a peak of 2,430 m. Its vegetation is dominated by pine forests, and at lower heights by holly oaks. In summer the mountains are very dry, although rainfall here is significantly higher than in the city of Madrid. Because of the proximity of the metropole Madrid it is a very populair hiking area and has it relatively good and well maintained trails. The Sierra Norte de Madrid is the most northern part of the Sierra de Madrid. The border between the Sierra de Guadarrama and the Sierra Norte de Madrid is not always clear (for example sometimes the Peñalara is considered as part of the Sierra Norte de Madrid). On hikingiberia.com we consider the area northeast of Cotos as the Sierra Norte. The area is 1,253 km² big and contains various sub mountain ranges such as Somosierra, Sierra del Lobosillo, La Cabrera and La Morcuera. Through this area flows the river Lozoya that connects with five reservoirs: Pinilla, Riosequillo, Puentes Viejas, El Villar and El Atazar. These reservoirs are of vital importance for the water supply to the Spanish capital. Further to the east in the province of Guadalajara, Segovia and Madrid lies the Sierra de Ayllón. Special about this mountain range is that the valleys have the most southern beech forests of Europe: La Pedrosa, Montejo and the nature park Hayedo de Tejera Negra. In these mountains a number of rivers arise such as the Río Jarama, Río Sorbe, Río Jaramilla, Río Berbellido, Río Sonsaz and Río del Ermito. This mountain range is a good altermative to - although farther away - visit from Madrid, because you see less people here and it has a different character than the Sierra de Madrid. It largely consists of slate and granite and to a lesser extent of gneiss, and it contains the last peaks of above 2,000 metres of the Central System, thanks to which it gives marvellous views both towards the mountains of Madrid and towards the lowland plain of Segovia. The Sierra de Ayllón is part of the Sierra Norte de Guadalajara, which forms a connection between the Central System and the Iberian System. Besides the Sierra de Ayllón it contains the mountains of Alto Rey, Pela and the Sierra Gorda, the natural park Hayedo de Tejera Negra, and the nature reserves Macizo del Pico del Lobo-Cebollera, Río Pelagallinas and Sonsaz. The area is criss-crossed with various basins of rivers such as the Jaramilla, Jarama, Lozoya, Sorbe and the Bornova. In the area also lie three important reservoirs: The Vado, Beleña and Alcorlo. Because of its climate it knows a big diversity of both forests - such as beech woods, oak woods, pine forests and tree vegetation on river banks - as well as bushes and grasslands. On the map you can find all the routes that are available in the Central System on hikingiberia.com. By clicking on the icon of the route, you will go directly to the description. During this hike we visit the two highest peaks of the mountains near the town of Busterviejo in the province of Madrid: The Cabeza Arcón and the Pico Pendón. Although both peaks are not higher than approximately 1,550 meters, we have a wide view on the surroundings from these tops. The landscape, which is characterized by rocks and boulders and reminds us of the landscape of the neighbouring Sierra Guadarrama, is very charming. On each route that we offer, you can leave your comments. On this page you can find information and walking routes in the Central System (Sistema Central), a mountain range that lies in Castilla-La Mancha, Castilla y León, Madrid and Extremadura. The free route descriptions of the hikes can be downloaded as PDF or GPX file for your GPS device and the trekking routes have been captured beautifully with photos, pictures and videos. Copyright © 2011-2019 Ibereffect S.L. All Rights Reserved.